BENSHEIM/BERGSTRASSE. On May 12, 1965, Germany and Israel began their diplomatic relations. 20 years after the Shoah, the genocide of the Jews of Europe initiated by Germany. Not an easy step, especially for Israel. But for both countries a historic opportunity for a new beginning. Regular state visits should make the partnership sustainable. It was made clear last Sunday (September 27, 2015) at an event in the south Hessian town of Bensheim that the rapprochement between Israel and Germany has to do with social and cultural encounters: Many people came together at the Jerusalem Friedensmal in the small district of Hochstädten to establish a collective sign for peace. The initiator, Thomas Zieringer, spoke of an "important meeting of generations and nations." The artist and organizer wanted to commemorate a "celebration of life". Despite the very serious subject: "After all, it's all about life and that has a lot to do with joy, love, beauty and hope. All of this is what the word Yerushalayim on the Border Stone stands for." For Zieringer, Jerusalem is also a vivid vision of a more humane world. Shoah survivor: "Touched to be here"
The chairman of the association (Friedensmal Wendepunkt e. V.) that is responsible for this project for peace was particularly pleased that some international guests have found their way to southern Hesse. As an advocate Batsheva Dagan, a Holocaust survivor, had specially made her way from Israel to Bensheim. The child psychologist and author, born in Lodz in 1925, said she was "touched to be in this beautiful place." As an ambassador of peace and rapprochement, she has been committed to an open debate on National Socialism and raising the awareness of children and adolescents for many years. "It hurts me that I'm going to hurt you," the historical witness said, looking back on her biography - a story of flight, expulsion, suffering and death. Mrs. Dagan was imprisoned in six prisons and concentration camps, including Auschwitz, and in the women's concentration camp Ravensbrück. At that time, she had vowed: "If I survive, the world must know the truth." The 90-year old was accompanied by ethnologist Prof. Sigrid Jacobeit of the Humboldt University in Berlin. The long-time head of the Ravensbrück Memorial praised the monument as a place of life, about which one can only be happy. Addressing Batsheva Dagan, Jacobeit said: "You belong here." The encounter festival was very well received. Among the prominent voices was Dr. Josef Schuster, President of the Central Council of Jews in Germany. He praised the Circle of Peace created by private initiative as an "important engagement". Unfortunately, Schuster could not attend in person as the Jewish Fest of Tabernacles, Sukkot, began at the same time. He expressed his hope that the gathering of people of both nations will transport the positive thoughts of the Circle of Peace into the world and will further strengthen the German-Jewish relationship. "An effective representation of an idea"
Shortly before his death in August of this year, the former Federal Minister Egon Bahr paid tribute to the Circle of Peace as an "effective and successful representation of an idea". The installation set in the countryside was both an enrichment as well as a perspective for the life of every human being. The Chairman of the German-Israeli Society in Rhein-Neckar recalled the rapprochement of both countries in the past five decades: "Miracles have occurred again and again. We hope for more," said Hannes Greiling in Bensheim. The Monument, as a positive place of reflection and reconciliation, was a visible expression of the wish that peace can finally and permanently prevail in Israel and its region. Numerous representatives of district and municipal politics accepted the invitation to the celebration. The new head of the district of Bergstraße, Christian Engelhardt (CDU), saw a clear message at the event for peace in the present and in the future. He stressed the historical conflicts between Israel and Syria, a region from where considerable numbers of refugees are currently coming to Germany. "Where there is peace, there is no reason to flee," encouraged the district politician. The Bensheim Mayor, Rolf Richter (CDU), spoke of a worthy event. He thanked Thomas Zieringer and the Association for their perseverance and constant commitment to the realization of the project. The project had been held back more than once in its over 15 years of development but also repeatedly encountered international attention. Musical accompaniment for the Celebration of Encounter was provided by the singer Dganit Daddo and the pianist Yuval Keidar, both from Israel, and the German songwriter Eloas Lachenmayr. The sounds of German and Israeli songs together made an exciting and harmonious impression, especially in their diversity. The highlight was the combined setting of Psalm 126 ("They that sow in tears shall reap with shouts of joy"), a premiere. Newly composed and texted in German by Eloas Lachenmayr, inspired by a Jewish melody. 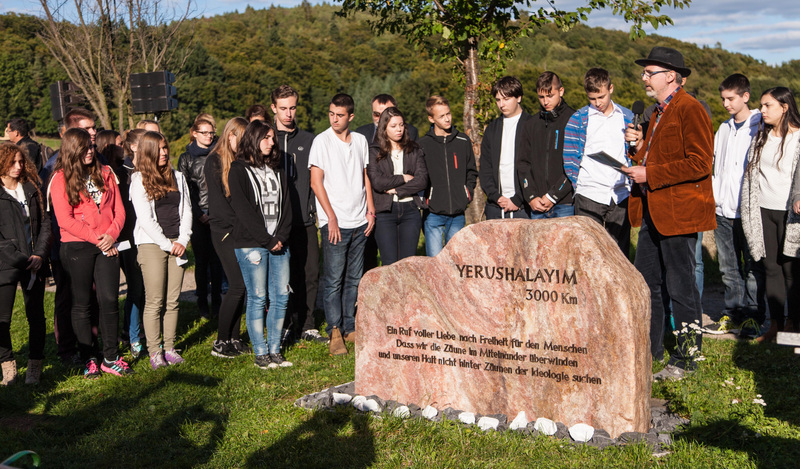 Many of the guests praised the atmospheric intensity of the event, which once again offered an impressive picture of partnership and rapprochement: Students from the Goethe-Gymnasium (high school) in Bensheim stood with guest students from Haifa at the "Rose of Shalom" in the center of the site. Together with Dganit Daddo, they sang the song "Jerusalem of Gold". After that, they placed marble pebbles at the Border Stone with the inscription: Yerushalayim. The banner of Jerusalem wafted over the installation in the sunlight. Below it, the flag of Hesse. Both with a lion in the center. For Thomas Zieringer, it was a unifying element of strong symbolic power. The lion was a metaphor for bold and just action. Freedom needs courageous and righteous people. He wishes that this site will be perceived even more strongly as a symbol of liberty and freedom of expression in the future. Together, students from Israel and Germany are bringing the "white stones" from the center of the Circle of Peace to the "side of hope" of the Border Stone. Here they are putting them down with blessings, they had worked out with their teachers for this event. Thomas Zieringer described the private project for the first time in 1998 in the context of his book “Vision of a New Humanity." The aim was a public installation as a symbolically charged sign of reconciliation and encounter. At the same time, it stands for a culture of remembrance and self-reflection. "Peace begins within each individual. Only then can we make a difference in ourselves and, thus, also in society," said Zieringer. The site refers to Jerusalem as the deepest root of European culture as well as the grave wound in this relationship. Therefore, this Site for Peace and Freedom refers to the historical responsibility of Germany in the context of learning to deal with the past. The site is dedicated to everyone. It stands for the beauty and the dignity of life and is a positive example of a forward-looking culture of remembrance. The monument site is located by the European long-distance hiking trail No. 8 in the Geopark Bergstrasse-Odenwald near Bensheim. It is situated approx. 60 km south of Frankfurt on Main between the cities of Heidelberg, Mannheim and Darmstadt.